Venerated as Kakinomoto Ookami 柿本大神 Kakinomoto Okami "Great Deity"
He was a truly "divine" Waka poet and is revered in many shrines in Japan, for various reasons. - He is revered as a deity to cure eye disease and other illnesses, with a legend about the 盲杖桜 "Blind Stick Cherry". Hitomaro's birth place. The priest of Toda Kakinomoto Shrine is from the 綾部家 Ayabe family, and he is the 49th of Hitomaro's mother's line. Other shrines mentioned below are introduced in the links given, but not in the -Introduction- links. 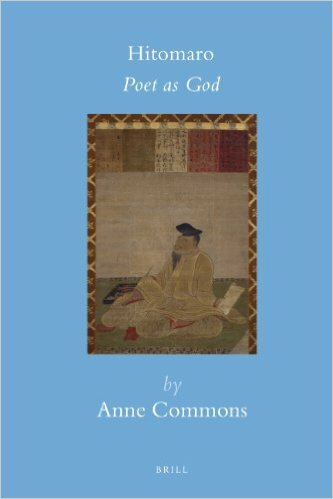 The Three Gods of Waka Poetry.
. Matsuo Basho, Oku no Hosomichi . Two shrines at the border to the Northern Territories. One on each side of the frontier line. On the inner side a shrine for the female deity (Tamatsushima Myojin 玉津島) to protect the interior. On the outer side a shrine for a male deity (Sumiyoshi Myojin 住吉) to protect from enemies of the outside. Travellers in the Edo period used to pray here for a safe trip and gave thanks after a trip was finished. 衣通姫 Sotoorihime and 山部赤人 Yamabe no Akahito. Many shrines dedicated to him are located in the 中国地方 Chugoku Region of Western Japan. His divinity is sometimes related to puns with his name, Hitomaru. 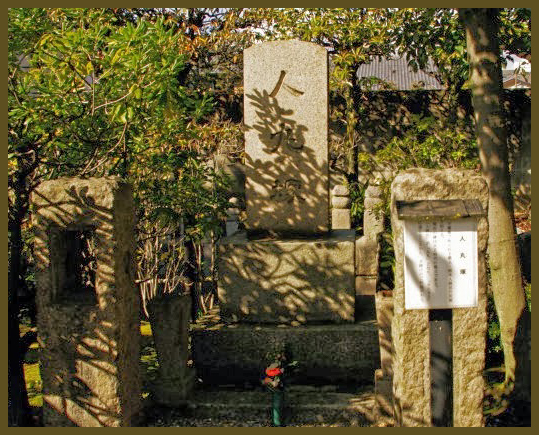 Hyogo and Yamaguchi have many shrines dedicated to Hitomaru. Hitomaru himself died an unnatural death. When Hitomaru was about 50 years old, there are records indicating that he was appointed to a provincial office in Iwami Province — today the western part of Shimane Prefecture. 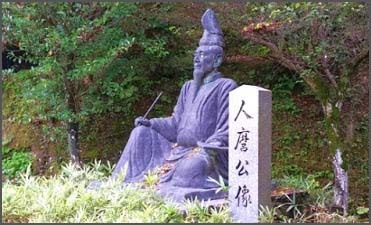 人丸大明神 is revered with a statue and scroll of his poems. 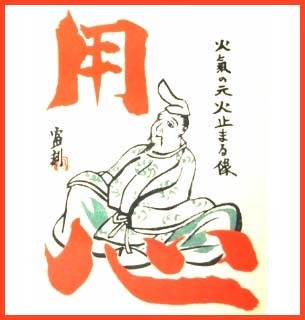 He is also celebrated as protector of fire and water disasters 防火 / 水神. During great famines 天明 / 天保の大飢饉 people prayed to him for salvation. Amulets from the Takatsu Shrine 高津柿本神社 are offered here. He is also celebrated as 疫病除・火難除・眼病平癒・学問・水難海上安全の神. A stone figure is venerated in a small sanctuary 小祠. In 18365, a a great famine was in the region, followed by dysentery and epidemic diseases. It only stopped when amulets from the Takatsu Shrine 高津柿本神社 were offered here. About 200 years ago, an epidemiy was in the region and only stopped when amulets from the Takatsu Shrine 高津柿本神社 were offered here. In 1900, a dysentery epidemy was in the region and only stopped when amulets from the Takatsu Shrine 高津柿本神社 were offered here. In 1799, an epidemy was in the region and only stopped when amulets from the Takatsu Shrine 高津柿本神社 were offered here. In 1800, an epidemy was in the region of 河内郷 and only stopped when amulets from the Takatsu Shrine 高津柿本神社 were offered here. In 1865, an epidemy was in the region and only stopped when amulets from the Takatsu Shrine 高津柿本神社 were offered here. In 1820, an epidemy was in the region and only stopped when amulets of 人麻呂大明神 were offered here. amulets from the Takatsu Shrine 高津柿本神社 are offered here to protect from epidemics. In 1835, an epidemy was in the region and only stopped when amulets from the Takatsu Shrine 高津柿本神社 were offered here. At the shrine 河築神社 in the compound, Kakinomoto is venerated to protect from epidemics. In 1851, an epidemy was in the region and only stopped when amulets from the Takatsu Shrine 高津柿本神社 were offered here. A statue of 人丸明神 is venerated as a protector deity for epidemics.
. Enmusubi 縁結び to find a good partner in life . 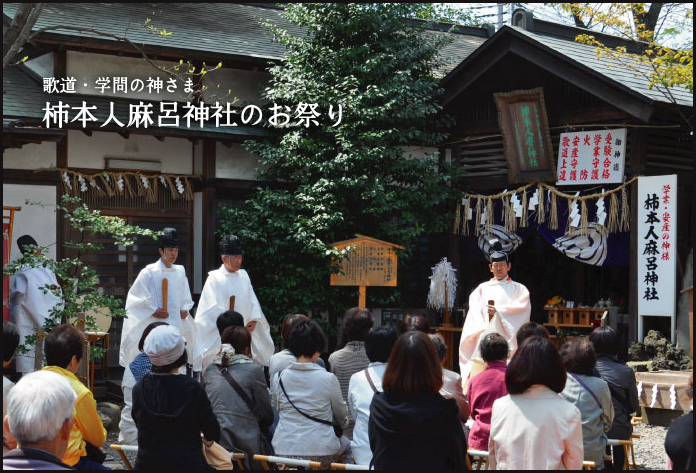 On his wanderings in Japan, Hitomaru came here, stayed for a while and taught Waka poetry to the local people. 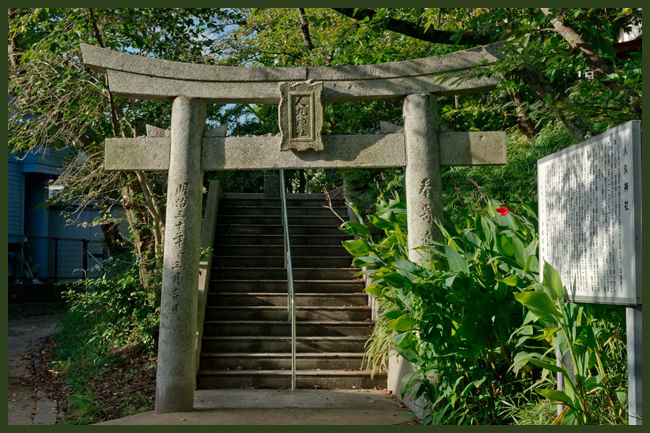 After his death, the shrine was erected with Hitomaru as deity of Poetry and Learning. A descendant of the Ayabe clan from Shimane is still Head Priest here, hence Kakinomoto is also venerated.
. Aragamisama, 荒神様 Kojinsama, Kojin sama .
. hi no yoojin 火の用心 watch out for fire - fire prevention .
. Munakata 宗像三女神 three female Munakata Deities . and two shrines dedicated to the Waka Poets - 和歌神社 Waka Jinja !
. 猿田彦大神 the Great Deity Sarutahiko . At shrines for this deity Kakinomoto is also venerated as 柿本大神. - 水刑死に処されて非業の死を遂げたことから - Because he himself found his death sentence through drowning. From waka mourning the death of a man from Sanuki Province, and a farewell poem at Kamoyama (Mt. Kamo) in Iwami province with elegies (banka, 挽歌) mourning his own death, many have seen this as Hitomaro acting as a palace official traveling to various provinces and reaching the end of his life in Iwami. 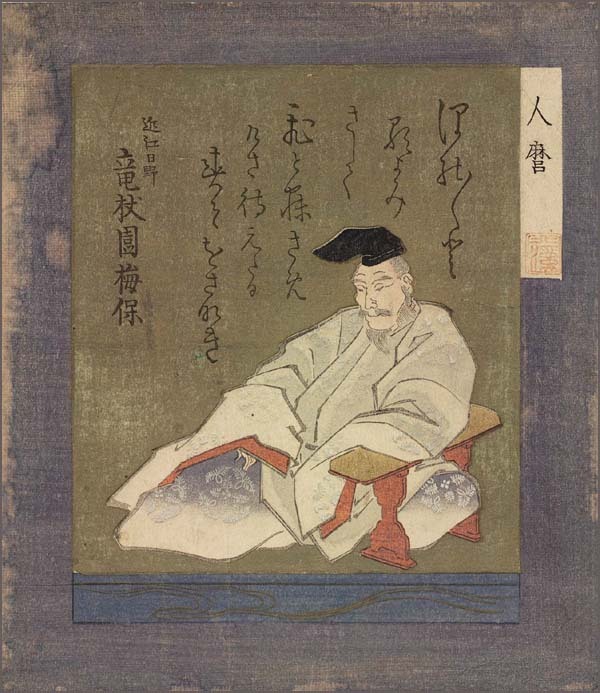 According to the Japanese scholar Itō Haku, however, this farewell poem is a folk drama portraying Hitomaro's own death, and the theory that the poem is a later counterfeit has also been suggested. and is venerated as deity at this shrine. The character for morning sun 旭 can be seen as consisting of the two characters 日 and 丸, combined as Hitomaru. CLICK for more statues of Hitomaro .